When the mercury rises and you don't feel like turning on the oven, using your microwave is a great way to curb your cake craving without heating up your abode. 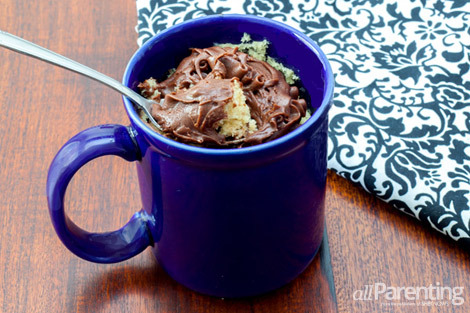 From chocolate lava microwave cakes to Irish cream cakes in mugs, you'll be drooling over these four microwave mug cakes when it's too hot to cook traditional dessert recipes. Just because it's too hot to cook doesn't mean you have to put your hankering for chocolate cake on the back burner! Using a coffee cup and these modified dessert recipes, you'll be digging in to decadent chocolate lava cake in minutes. Place eggs and brownie mix in a single coffee mug and mix well. Once well blended, push the chocolate squares into the mixture until they rest in the middle of your batter. Place mug in microwave and cook on high for 1 minute and 30 seconds. Top with vanilla ice cream, drizzle with caramel sauce and serve warm! You can opt to invert your cake in a mug on a plate before topping with ice cream and chocolate sauce, if you should so prefer. This vanilla chocolate chip cake dessert recipe is so easy it will become your go-to summer dessert all year long! 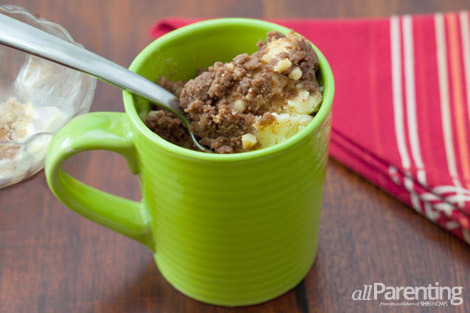 It may be small but no doubt tasty — mug cakes help you ditch that guilt of eating an entire cake! Combine all ingredients except frosting in mug until well combined. Place in microwave and cook on high for 2 minutes or until cake rises above the rim of the mug. Remove from microwave and allow to cool completely. You can place in refrigerator to speed up the process if so desired. Once cooled, top with your favorite chocolate buttercream frosting and indulge in a single serving of your favorite chocolate chip cake! You'll wonder how you ever had a morning cup of Joe without it once you've coupled your coffee with a mug of coffee cake that's a guaranteed delicious start to your day. For the topping, place butter in your mug and microwave until just melted. Remove from microwave and mix in flour, brown sugar, cinnamon and walnuts until sandy clumps are formed. Spread out mixture on waxed or parchment paper on a plate and refrigerate until needed. For the cake, cream together butter, sugar and vanilla in mug until smooth. Add in egg to mixture until thoroughly combined. Add sour cream to the mixture and blend until smooth. Remove topping from refrigerator and sprinkle on the top of the cake mix and microwave for 1 minute and 15 seconds, or adjust to your particular microwave and serve with your favorite cup of Joe! 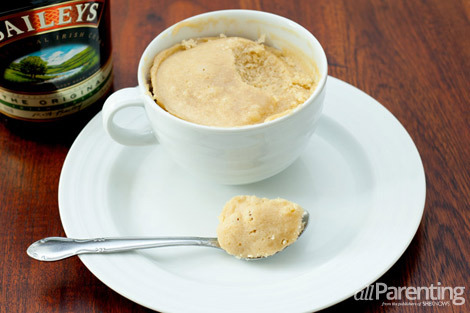 Bake up a cocktail in a cup when you add a little Irish cream to your microwave mug cakes — no shot glass required! But, if you're serving up some cake to the under-21 crowd, you can substitute the liquor with a little Irish cream-flavored creamer without losing the fabulous flavor you seek. Combine all ingredients in the above order in your microwave mug and mix well. Place in microwave and bake for 1 minute 30 seconds, adding 30-second increments until a toothpick comes out clean from the center and enjoy!